This is the cover of the book. These are just a FEW of the examples of things this author has found with smiley faces on them! All through this book it is filled with items you would never think to look at as Smiley Faces! Hidden SMILES! Forget smiling, you'll be grinning from ear to ear after one peek inside this book. The text is all about being optimistic and the photographs are, well...Smileys. Hidden Smileys, that is. For instance, did you ever look at your dinner plate and notice that the dash of applesauce, pile of corn and hotdog were making a Smiley face at you? Ruth did! And she used the Smileys she found everywhere to illustrate her book (divided by color, of course)! Check out this video from YouTube! This book will make preschoolers giggle, older children want to borrow your camera and go on a Smiley hunt, and adult grin. Ruth even has a Smiley song you can link to on your blog! And the best part is, every photo of a Smiley uploaded to Ruth's website "earns" $1 to be donated to Operation Smile, which pays for surgeries for children with facial deformities such as cleft palate. Here's an example of a Smiley Face! 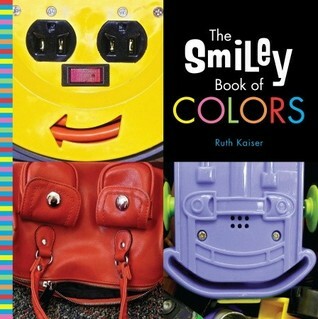 This unique hardcover, which grew out of the popular website Spontaneous Smiley, will appeal to kids and adults. Who can resist the wacky, cute smiley faces to be spied in photos of colorful found objects? Young readers will enjoy learning their colors as they're identifying what the smileys are made from—an electrical outlet, a hubcap, even a piece of toast which is above! Readers of all ages will appreciate the witty rhyming text, and its inspirational message about choosing happiness. The Smiley Book of Colors contains a rhyming verse written to get parents talking to their children about optimism, specifically about choosing happiness. The photo illustrations -- arranged by color -- are "Smileys" found hidden in fire trucks, flowers, clouds, even mommy’s latte. Although it is a children's picture book, A Smiley Book of Colors is really for anyone who needs a burst of happiness in their day. 5 star by far! Outstanding! This book is beautiful! Creative! FUN! Kids are going to LOVE this book! Now YOU will find smiley faces in things you never thought you would! I can't stress enough how much this book should be in your child's library! It's beautiful, bright, cheery! It put a whole NEW spin on smiley faces for me! It will for you, too. I was just as enamored as any young child would be with this cheery, happy book! That is what this book makes you feel like! HAPPY! You've GOT to get this! Ruth is proud to be a self-proclaimed, happy-go-lucky, cockeyed optimist. Also known as a Pollyanna, a goofball, and little Miss Sunshine, Ruth is an easy breezy, cup runneth over, top of the world, outgoing, people loving, fun seeking gal. This perky gregarious, cracking herself up child at heart is filled with gratitude every minute of every day! Although completely allergic to cats, she is also completely enamored with them. So Philbert, Noodle, Rooster, and Mr. Simon have the run of the house and Ruth sits on a plastic chair and washes her hands a hundred times a day. It’s a choice you can choose. For every Smiley photo that is uploaded to the Spontaneous Smiley website, one dollar is donated to Operation Smile, to fund reconstructive surgeries for children with facial deformities such as cleft palate and cleft lip. The Spontaneous Smiley has funded eighteen surgeries so far, one Smiley at a time.